Congratulations to our first annual Laurie Rogoway Outstanding Jewish Professional Award recipient, Andy Gitelson! Andy is the Executive Director of The Oregon Hillel Foundation, and was recognized on June 10th at the Jewish Federation's Annual Meeting for his commitment to the field of Jewish professional leadership. This award is sponsored by the Jewish Federation of Greater Portland in recognition of Laurie Rogoway, a pillar of Jewish professional leadership for over 30 years in Portland, who retired earlier this year from the Jewish Federation after an exemplary career. Inspired by Laurie’s example, this award recognizes a Jewish professional leader who demonstrates outstanding professional work and a commitment to the field of Jewish professional leadership. This professional supports the future vibrancy of our community, understands the issues facing our community, approaches her/his work in a creative way and is a team player. The recipient receives a gift of $1000 to be used towards a professional development program of their choice. Andy has significantly increased the number of Jewish students involved in Hillel and donors supporting it. Having identified a void of Jewish life at OSU, he brought Hillel services to this campus, too. 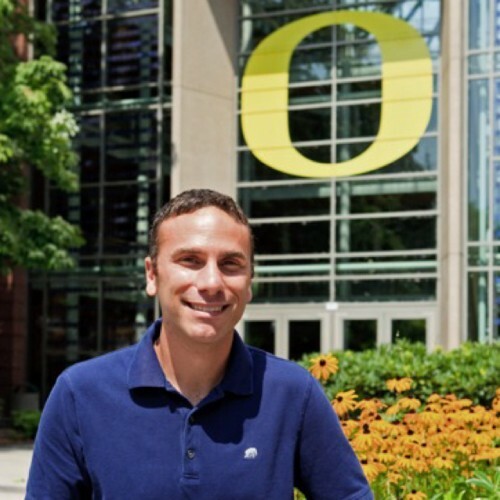 In addition, Andy recognized the need for a Jewish connection for Eugene’s post-college young adults and started Jewgene, in collaboration with Oregon Hillel, the Jewish Federation of Lane County and Temple Beth Israel of Eugene.